A large portion of personal injuries resulting from the effects of an extreme external force on a structure are due to glass fragmentation. This makes external glazing critical to the safety of a building’s inhabitants and the protection of its contents when subjected to blast, wind-borne debris, impact, and other critical loads. ASI can afford clients with a better understanding of the performance of a structure’s glazing during such events, allowing for more informed decisions on the options, upgrades and enhancements that will ultimately save lives and protect assets. ASI’s Applied Element Method (AEM) based Extreme Loading® Technology (ELT) is the only analysis method on the market that can accurately analyze the behavior of glazing during impact and shattering. 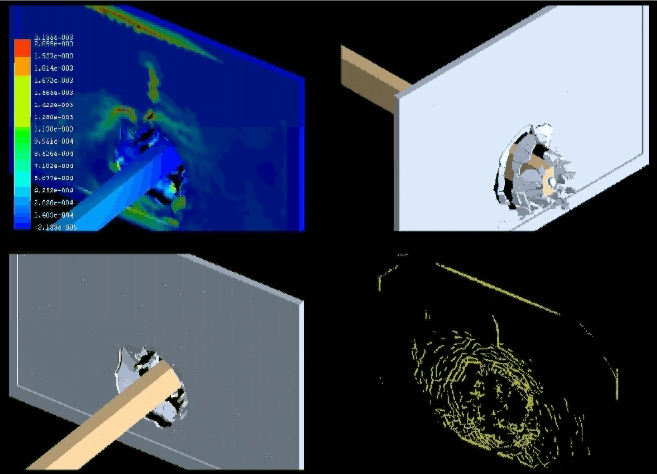 ASI’s engineers are able to analyze and predict the failure modes, velocity, and final footprint of glass and its layers. Additionally, ASI can analyze prospective glazing systems prior to implementation. Creating a model that can include window system, laminate, reinforcement, and glass thickness. Generating technical reports detailing the results of the analysis and main conclusions. Supporting 3D simulation videos and diagrams.